Once you’ve highlighted and saved a passage, PowerNotes will also automatically capture the citation information provided by the source. Note-taking Popup - the Citation icon is found at the bottom of the annotation popup that appears after you’ve highlighted and categorized something. Browser Sidebar - the Citation icon appears after each quoted highlight in the project sidebar. Clicking on the Citation icon associated with a particular highlight will allow you to view and edit the associated citation information in the PowerNotes sidebar. General webpages: for sites like news sources, blogs, etc., PowerNotes gathers the metadata necessary to put together a citation. Note that not all websites put all the info you need in their metadata, so you may need to add omitted information. PDFs: for PDF documents, the database provider hosting the PDF usually provides citation and formatting options. So we have provided you with an empty field where you can copy and paste the appropriate citation, along with the “digital object identifier” or “DOI” (DOIs provide permanent and reliable links, as well as citation information, for many academic articles). To learn more about or search DOIs, click here. Legal research sites: for Westlaw, Lexis, Bloomberg Law, and HeinOnline, we automatically gather the citation provided by the site when available. Note that this citation is provided by the site and may not be in the correct format, so please double check these citations. Remember, you cannot necessarily rely on the information provided by the website. Make sure that you check to make sure that what the site is giving you is correct. To help you with this, we want you to save your citation info before you use it. If you’re conducting research on EBSCO, there are a few things to know about capturing citation information. Once you have highlighted something in an EBSCO article, open up the citation pane associated with that highlight by clicking on the “quotation mark” icon. Now you are ready to add the citation provided by EBSCO. On EBSCO there are two places you can find citation information: (1) on the “Detailed Record” page and (2) within the “PDF Full Text” page, you’ll notice icons on the right side of the screen. Citation information can be found by clicking on the rectangular yellow page icon, which will provide you with a range of citation formats. Simply copy the citation in your desired format and paste it into the citation field in the PowerNotes sidebar. Make sure the citation is correct as database citations can have errors. Then click “Save to Sources” once you have verified the citation. Remember, if you checked the “Apply to all sources on this web page” box, you will only need to do this once per article. You can edit almost all the information in the citation info form by clicking into a field to edit or add information. The only field that you cannot edit is the “Date Accessed” field (the system populates that field with the date and time you saved the associated passage). Once you have verified that all of your citation information is correct, you can choose to apply those changes to all citation information for that webpage by clicking the “Apply to all sources on this web page” checkbox. When you select this option, PowerNotes will apply any changes you made to the citation info for that passage to all passages you gathered, or may gather in the future, from that source. PowerNotes does this so you only need to edit the citation information for most sources once. Note that the “Apply to all sources on this web page” checkbox is checked by default. Also note that on legal research sites you won’t see this option as we don’t want to accidentally overwrite pin page citation information. After you have made all your edits, click on the “Save to Sources” button at the bottom of the citation info form to save everything (and apply changes to all highlights on that webpage or PDF if you checked the “Apply to all sources on this web page” box). The Citation icon for citation info that has been “Saved to Sources” will now appear green, while the Citation icon for citation info that hasn’t been saved will remain gray. Saving citation information to your sources is important if you want to export citation information to other citation management software, as described below. In your project outline, you can quickly view all of your citation info by showing citations using the filters on the right side of the project outline page. 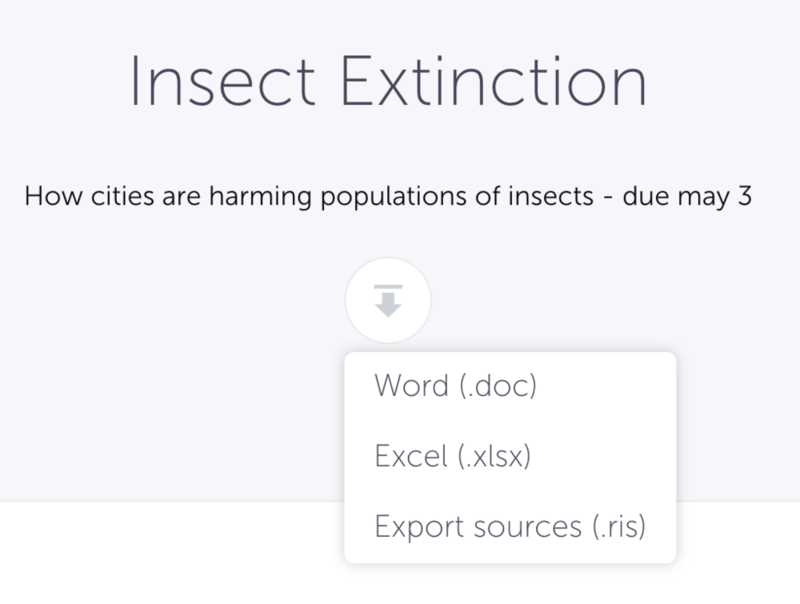 Word doc: selecting the Word (.doc) option will download all project outline data (like your saved passages and annotations), including all saved citation information, to a Microsoft Word file that you can open in Word or Google Docs. RIS file: selecting the Export sources (.ris) option will export only saved citation information (meaning those citations where the Citation icon is green) to an RIS file that you can import into other citation management tools such as EasyBib, Zotero, EndNote, and Refworks to create a bibliography. If you don't have the PowerNotes Chrome extension installed you can get it here. For more tips and information on how to use PowerNotes, see our help page. 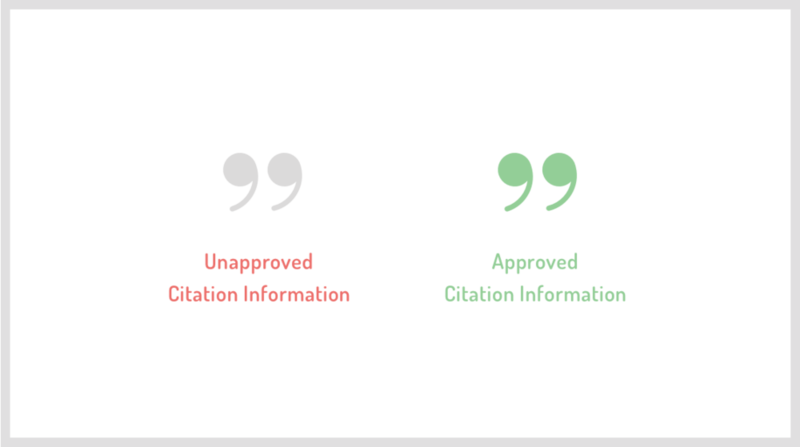 If you have an issues using the citation feature, feel free to get in touch with us.